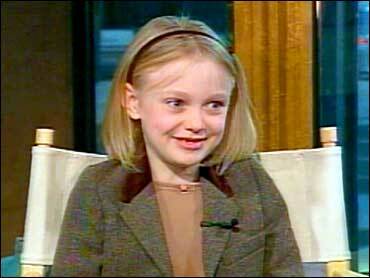 Nine year-old actress Dakota Fanning has a career that many adults would envy. Her latest big screen appearance comes in the hit holiday movie "The Cat In The Hat." She plays an uptight little girl in need of some serious fun. The film was anything but work for the young Dakota. She tells The Early Show co-anchor Rene Syler, "I'm like Sally in that I'm neat and tidy but I'm not uptight or anything like that." Bright and full of laughter, Dakota says it was a lot of fun to work with Mike Myers in the current No. 1 box-office movie. She says, "He was so fun to be around. Every day, you couldn't wait to see Mike. I loved all of the characters that he changed into. One of my favorites, he changed into the cook guy and the plumber and Carmen Miranda and the matador is one of my favorite parts. I love the hat." The precocious girl has also taken different roles in the past. She was first recognized for her performance as the daughter of a mentally-challenged man fighting to retain custody in "I Am Sam." For that, Dakota was nominated for a Screen Actors Guild Award. "I feel so blessed to be doing something that I love to do and I have so much fun doing it," Dakota says. She has worked with Michelle Pfeiffer, Sean Penn and Brittany Murphy. Asked if she ever feels intimidated by sharing the bill with big name actors and actresses, Dakota says, "I think they're so nice and they make me feel so comfortable that it's hard to be intimidated. You're having such a great time and just it's so fun to be around everybody and be on the different movie sets." On a personal level she is missing two teeth. "I had to have them pulled," she says, "I had to make room for my adult teeth." So what does a tooth fairy pay right now? "I got five gold coins per tooth," she says with a big laugh. Next for her is "Man On Fire" starring Denzel Washington and Christopher Walken. At age 5, appeared in a TV commercial for Tide detergent. 2000 - TV debut in an episode of NBC's "ER" in a storyline involving a sick child requiring a bone-marrow transplant. Also portrayed the title character at age 5 in an episode of "Ally McBeal"
Went on to have guest roles on several popular TV shows like "CSI: Crime Scene Investigation," "The Practice" and "Spin City." 2001 - Film debut in bit role in "Tomcats." Same year had her first major feature film role as the daughter over whom a mentally-challenged man fights to retain custody in "I Am Sam." 2002 - Played an asthmatic child kidnapped and held for ransom in the thriller "Trapped." Also appeared as a young Reese Witherspoon in "Sweet Home Alabama." 2003 - Co-starred with Brittany Murphy in "Uptown Girls." Received Broadcast Film Critics Association Award for Best Young Actor/Actress for "I Am Sam" (2001). Received Golden Satellite for Outstanding New Talent for "I Am Sam" (2001). Shared with Rupert Grint ("Harry Potter and the Philosopher's Stone").